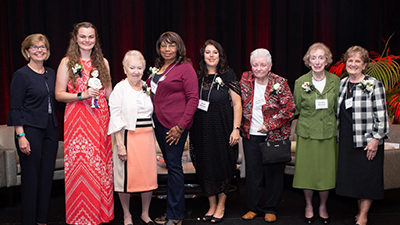 (From Left) Michelle Murphy, Malta’s Executive Director, congratulates the Wonder Women Class of ’18: Mikaela Nelson, Rosa Morales, Hyacinth Yennie, Sr. Maureen Faenza, Dorothy Beaucar, and Sr. Theresa Fonti. In 2011, Malta House of Care instituted the “Celebrating Wonder Women” awards ceremony and fundraiser for two reasons: to spotlight Connecticut women who are improving their communities, on the stage or behind the scenes – and to support the Malta House of Care Mobile Medical Clinic, which provides free primary health care to uninsured adults in Greater Hartford. Since then, Malta has honored 63 women for the extraordinary impact they’ve made in their communities, in often very ordinary ways. Join us on Thursday, April 25, 2019 for “Celebrating Wonder Women ’19” to celebrate the remarkable community service of six more “Wonder Women” and to raise needed funds for the Malta House of Care Mobile Medical Clinic.